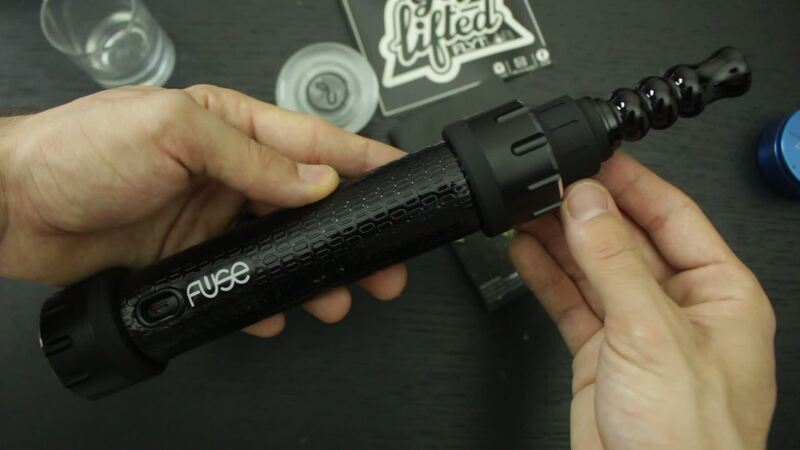 Today we’ll be reviewing the Fuse by FlytLab, an herb, oil, and e-liquid vaporizer that can use two cartridges at once. 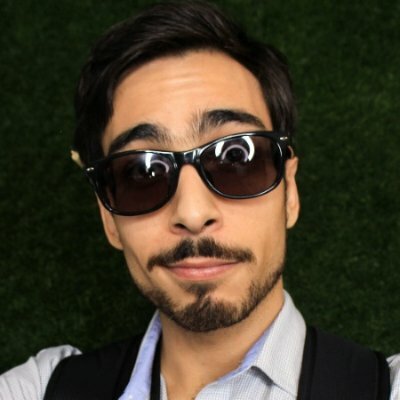 When I first saw the Fuse at a trade show and discovered I could vape my herbs and oils at the same time, I was immediately intrigued by the prospect of the product. I’d never seen a double barreled vape before, so I was eager to review this new toy. But after actually getting it in my hands and using it on a regular basis, what seemed like a game changer became another gimmick.
) When you first get the Fuse in your hands, you get the sense you’re holding a nightstick more than a vape. It’s black, 11 inches long, weighs nearly a pound, and is coated in a padded plastic material similar to gym mats. If you prefer your tech to have a heft to it, and you crush box mods with your man hands, this is the perfect vape for you. The build itself of the device was pretty quality, and I personally dig the black aesthetic. The mouthpiece unscrews, often with a screech, to reveal the cartridge chamber where you can screw in two of the provided dry herb, oil, or e-liquid cartridges side by side. For tokers with bigger hands, it can be a little hard to unscrew the cartridges when two are in use.
) The cartridges themselves weren’t made too well either. I had a case where the cap of a e-liquid cartridge pulled off while screwed inside the vape and required pliers to remove. And when I popped in the oil cartridge, I found that it was defective, the coils didn’t activate and my hash was lost. The homies at FlytLab were on point though and sent over a replacements right away. The dry herb cartridge held a minuscule amount of finely ground greens, blazing your herb in one hit, requiring me to repack the vape after each time. In terms of performance, I was able to get decent clouds with the e-liquid and dry herb cartridges. But like I mentioned before, I only got 1-2 hits off the dry herb cart before it cashed the 0.1 grams completely. And unfortunately, this vape suffers from a common problem with most cheap oil vapes where the atomizer doesn’t vape your hash unless you pack a huge hit. The coils in the oil atomizer are too high above the bottom of the chamber and don’t make contact with hash unless you drop it directly on the coils, and a good amount of it, or if you add more hash to make the oil pool up high enough to reach the coils. I had this problem with the Evolve and it made the device basically incredibly unappealing for it’s waste of concentrates. For e-liquids, you can get back to back clouds.
) Let’s talk about smoking experience, how was it to actually sit down and use this thing. The Fuse doesn’t have any buttons, you simply inhale and a light on the bottom indicates the device is on and heating. I love intuitive devices, it makes it easy to hand this vape to your friend in a session and have them smoke effortlessly without a fifteen minute seminar on vape operation. The only problem is, because the light is on the bottom of the vape, it makes it impossible to tell if it’s working until you get a hit, have a friend spot the light for you, or kinda hold your hand underneath and hope to see the faint glow. The Fuse battery lasted few solid days with moderate use, and charging was simple with the microUSB port. We have to talk about the noise. When I first heard it, I didn’t know how to describe it. I knew what it was supposed to be: the sound of water bubbling inside a hookah. But what it actually sounded like was what could only be described by a subscriber on YouTube: “like hammers hitting metal”. The sound upon inhalation can be turned off with three quick breaths, which let me tell you, was another task. Discovering the correct timing for the three breaths was tricky, I was either too fast or too slow. I got it working after a few tries, though I never do it on the first try. Overall, I wasn’t a big fan of this vape. It had a lot of cool qualities, but they weren’t redeeming enough to outweigh the cons. I loved the “fusion” of flavors with two cartridges, the intuitive no-button system, the battery life, and the aesthetics. This could be an even better vape if there was an visible indicator that I’m vaping, rather than on the bottom. The oil and herb cartridges were also basically useless. And the vape is incompatible with 510-thread concentrate cartridges from dispensaries, so I have to use cannabis e-liquid in a refillable form. If they could fix the cartridges and make a 510-thread adapter/converter, I could see this vape reaching a much broader market. I’m usually a fan of bigger and thicker technology, because it doesn’t feel as flimsy as some streamlined products, however this vape was a little too big for my taste. It made it difficult to carry around in my bag, and it added a fair amount of extra weight to it. I’d almost rather carry two or three smaller vapes that each do herb, oil, and e-liquid individually because they take up way less space altogether. Basically, this vape isn’t for people who want to vape herbs or oils. It’s more for the e-liquid vaping crowd. Anyone interested in anything other than vaping juice, this is not the solution for you. But if you’re a dude who vapes and keeps it simple, doesn’t want one of those complicated vapes that can calibrate wattage, and you want to be able to mix that Strawberry Shortcake and the Purple Monkey Balls juice you got — this is the vape for you. I give this vape an 5/10. It’s a solid e-liquid vape, but it’s advertised to do dry herb and oil, and it does the latter two poorly.